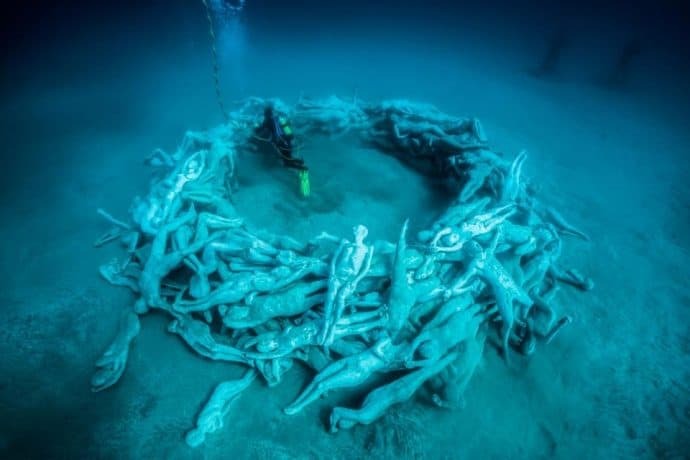 We first became fans of environmentally-focused artist Jason deCaires Taylor back in 2013, when we explored his stunning Cancun Underwater Museum (a.k.a. Museo Subacuático de Arte). As an art exhibit it was incredible, with around 500 statues cast from local residents. 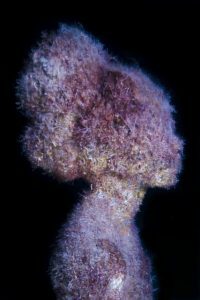 The lifelike statues were made from marine grade cement, sand, and micro-silica, and many had colorful coral attached. But it was equally impressive for its environmental impact, created to draw tourist traffic away from the overused MesoAmerican reef. 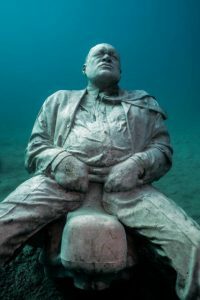 This week the British-born sculptor unveiled his latest marine conservation masterpiece, the Museo Atlántico, in Lanzarote. 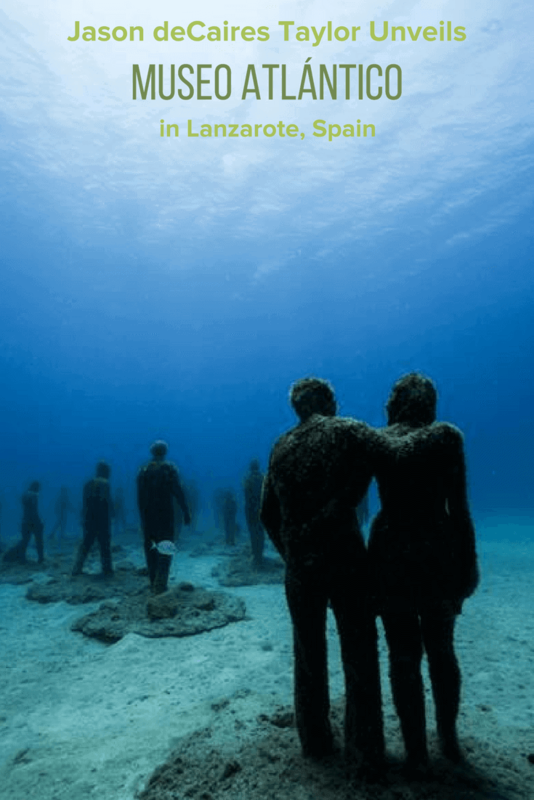 Located in Spain’s Canary Islands, 78 miles off the coast of Morocco, the 26,909 square foot attraction is the first underwater art museum in Europe. The permanent exhibition consists of over 300 works in 12 different themed installations, each of which touches on sociopolitical topics related to the exploitation of natural resources and the importance of conservation. Though the style is similar to his work in Mexico, this is the first time Taylor has installed large-scale architectural elements, including a 100-ton, 98-foot long wall. 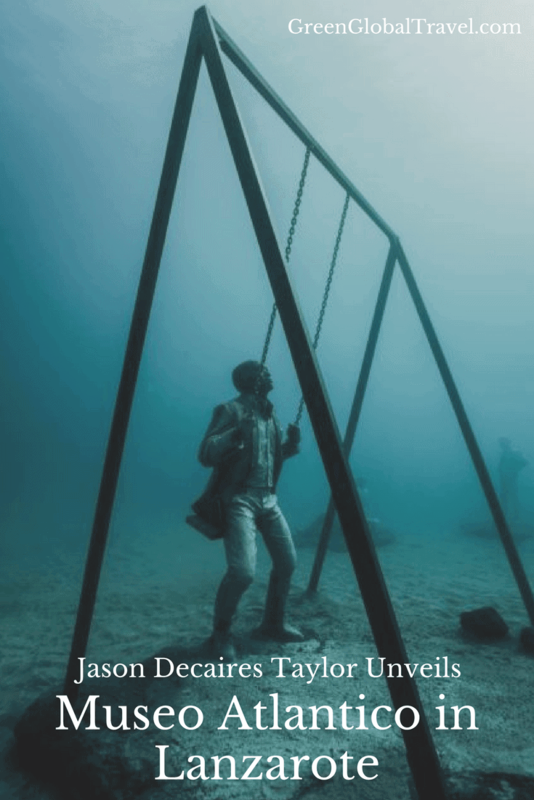 While his art is aesthetically exceptional, the work of Jason deCaires Taylor also serves a more practical purpose. 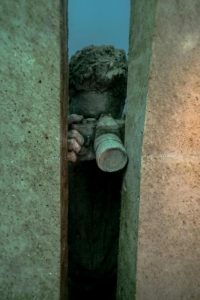 Over time, his lifelike sculptures evolve into artificial reefs, encouraging the growth of coral and attracting marine life. Once his sculptures are lowered into the sea at depths of 15-30 feet, Taylor grafts coral nubbins onto them. The mesmerizing contrast between organic and synthetic lifeforms reinforces the artist’s central theme, illustrating that human interaction with nature can be sustainable and symbiotic. 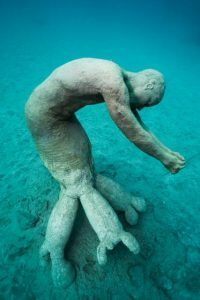 The final phase of his new Lanzarote project was officially inaugurated on January 10th with an unusual underwater ceremony. Jason deCaires Taylor and Pedro San Ginés, the president of the island, shared ribbon-cutting duties on the seabed of Las Coloradas bay. The 2-year Museo Atlántico project has already shown benefits to the local marine ecosystem. The first portion, which was installed in February 2016, has already seen traffic from Angel Sharks, Barracuda, Sardines, Octopus, and Butterfly Stingrays in what was once a lifeless seabed. 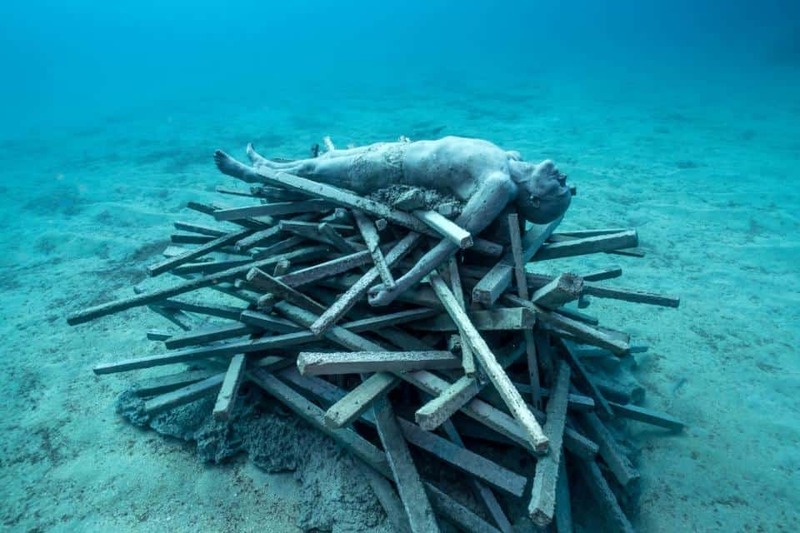 Made from a stack of concrete sticks built to look like a traditional funeral pyre, this sculpture was molded from a local fisherman from the northern Lanzarote island of La Graciosa. 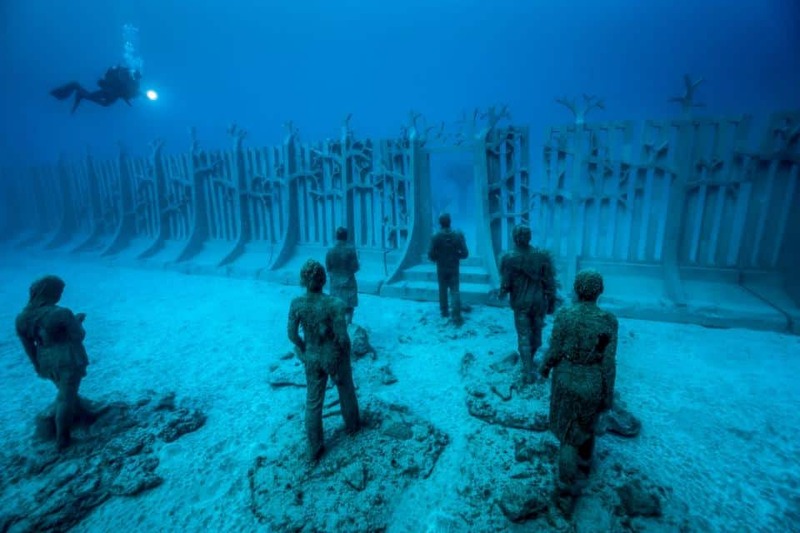 A group of 35 figures walk towards a 98-foot long wall, whose single door offers a portal to the Atlantic Ocean. The piece is a monument to the rampant absurdity in the world today: There are myriad ways over and around the dysfunctional barrier. “Crossing the Rubicon” emphasizes how mankind’s notions of territorial boundaries are meaningless to the natural world. In a world gone mad with patriotism and protectionism, this piece reminds us that we are all an integral part of a living, breathing planet. Our oceans, our air, our climate are one, and we must work together to protect them. 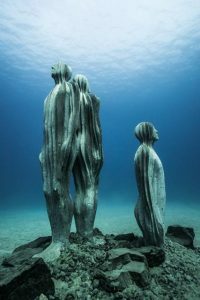 According to Jason deCaires Taylor, this work marks 2017 as a pivotal moment. It’s a line in the sand signifying that our climate is changing, and we need to take urgent action before it’s too late. 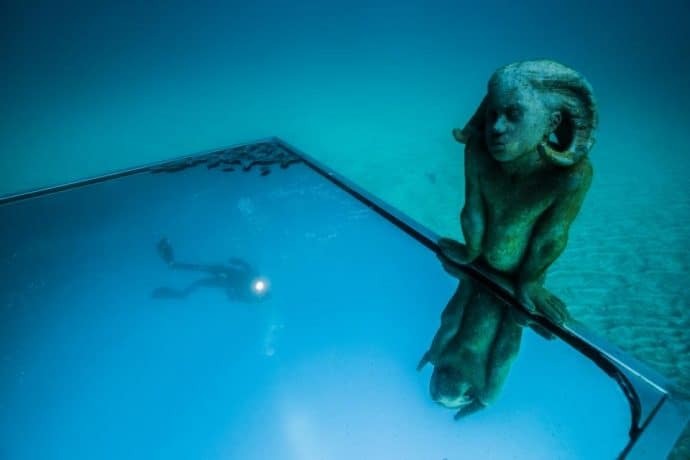 This piece depicts a haunting human/animal hybrid gazing down into a large square mirror, which reflects the constantly moving surface of the ocean. Forming part of an underwater botanical garden, the work is intended to portray water within water, providing a looking glass into another world– the blue world. The mirror is elevated on a series of cactus forms, which contain small compartments and “living stations” designed to attract Octopus, Sea Urchins and juvenile fish. This piece consists of several businessmen in suits taking over a children’s playground. Their attitudes as they swing, see-saw, and a ride a play dolphin showcase the arrogance the corporate world seems to have towards the natural world. Like a spoiled child with a disposable plaything. The see-saw references a petroleum extraction pump, with Taylor making a comment on the control and unregulated use of fossil fuels. The dolphin ride is symbolic of the undue burden our consumption-based society is placing on marine life, and its ultimate collapse if left unchecked. 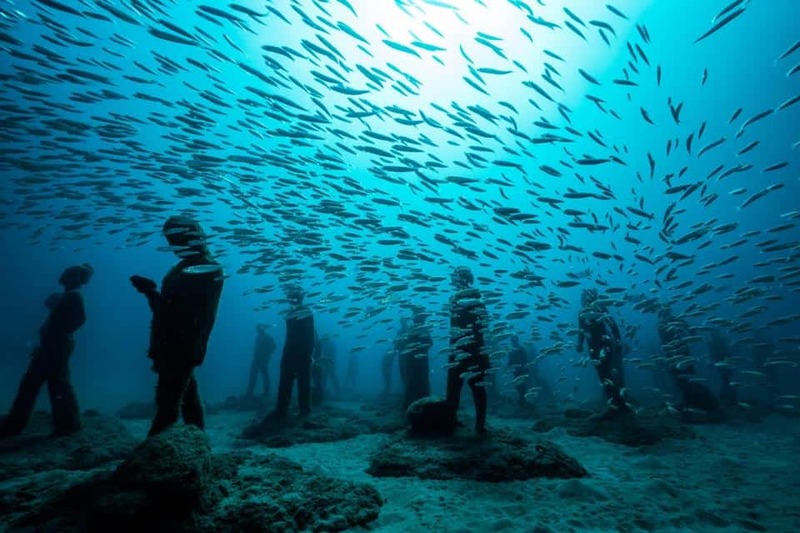 The final exhibit at the Museo Atlantico is comprised of over 200 life-size figures in a vast circular formation, or gyre. 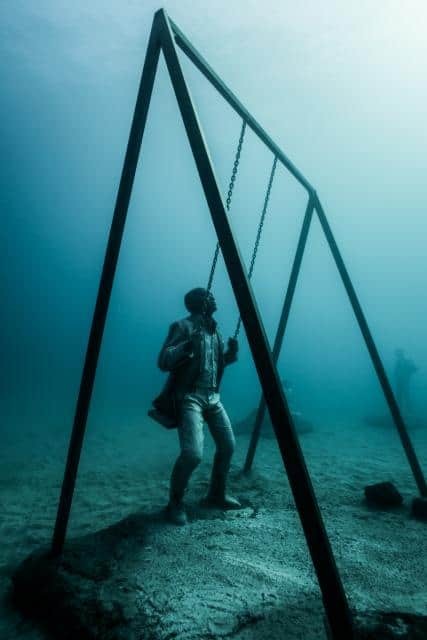 Consisting of statues made from models of varying ages and all walks of life, the piece’s positioning constructs a complex reef formation for marine species to inhabit. It’s also a strikingly poignant image for visitors to reflect upon at the end of their tour. 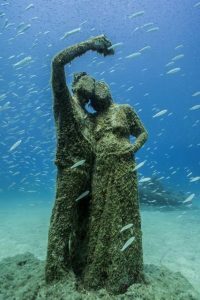 According to Jason deCaires Taylor, the piece is designed to remind us that all of humanity originally evolved from marine life. And all of us depend on the ocean– for the oxygen we breathe, regulating our climate, and providing nutrition– for our survival as a species. The work symbolizes our naked vulnerability to the power of the ocean, and our fragility in the face of its immense force.